timing belt will be jammed cylinder valves. 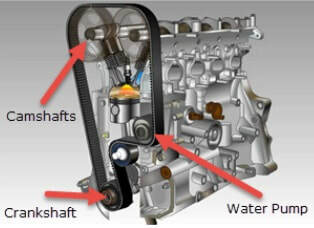 The Camshaft Timing Belt (or Cambelt) connects the crankshaft at the bottom of the engine with the camshafts at the top of the engine. The teeth on the belt and on the crankshaft and camshaft sprockets ensure that the valves open and close at exactly the right times. The intake valve opens to allow fuel and air into the cylinder, then closes as the mixture is compressed then ignited, then the exhaust valve opens to allow the waste gasses out. should also be replaced to prevent future failure as a result of reusing worn parts. On many vehicles, the pump that circulates coolant or antifreeze around the engine is also driven by the cambelt. Replacing this pump at the same time as the cambelt avoids the risk of the pump leaking or seizing as a result of worn bearings.